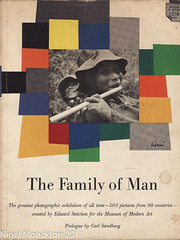 A few weeks back I found a catalogue from the Family of Man exhibition in a local second hand bookshop. Plenty of background to the exhibition here in Wikipedia and here at the MoMA website. The basic premise of the exhibition was to demonstrate the commonalities that humanity shares and should be seen in the context of the end of World War II only a decade earlier, the recently ended Korean War and the ongoing Cold War. The catalog contains some wonderful photography – and is neatly arranged by human themes such as religion, childbirth and work. Sometimes this works, as in the spread of people dancing, sometimes it seems to me to highlight difference rather than commonality – for example the father&son pictures while aiming to show the similarity seem to me highlight the differences between, for example, the hunting Bushmen and the suited middle class American on a couch with his son. My favourite photo overall is probably the Hunting photo referenced above, although it is run close second by a rather emotional shot from Richard Avedon which seems rather at odds with the stuff for which he is usually recognised. My favourite spread is the double page of people dancing in circles, which seems to me to capture the commonality of the human experience better than anything else in the catalogue. Other impressions – well, war is rather under-represented. I suspect that the timing meant that dwelling on images of war was probably never going to be popular but, given that it is not until the generation after the exhibition that war stops being a shared experience for most of humanity, it seems a bit of an oversight. The other lasting impression is the over-representation of American photographers – who exactly is Homer Page? I’m going to have to look him up, because I don’t recall seeing him referenced anywhere before this exhibition – yet Arbus and Sanders get but a single shot each unless I’ve missed one – and why Lewis Carroll but not Muybridge, JM Cameron or Atget. And I can’t help feeling that the Ansel Adams shot is included simply as a nod to his popularity since the included shot has, at best, a tenuous connection to the stated theme. For all this it is a truly fascinating collection – the photos can make you smile, make you reflect and sometimes just make you shake your head in despair. If you get a chance to by the catalogue – do it – for the photography, and for what it says about people.